For reference only. This application cannot be completed. The 2018 grant submission has closed. Note: Depending on membership totals, additional grant funds may be available. Check this site periodically for grant updates. Please indicate which category best describes your grant application. (Select one). Please Note: choosing a different category after uploading your documents will delete all your documents and require you to upload them again. Certification: Our organization and its Board of Trustees authorize submission of this proposal. Our tax-exempt status under IRS Section 501(c)(3) has not been revoked or modified. We understand that if we are selected to receive funding, we will be required to provide reports as requested showing how funds were spent and that the funds were spent solely for the purpose for which the grant is sought. We certify that,to the best of our knowledge, the statements contained in this application are true, accurate and complete. We understand that we will be expected to sign a Grant Agreement if we are the recipient of an Impact 100 grant. Provide the following information for your overall organization. The Mission Statement and a brief description of your history. Need or problem your organization works to address and the population your organization serves, including: number of individuals, geographic location(s), and relevant demographic information. Current programs and accomplishments. Emphasize the achievements of the recent past. Number of paid full-time staff, number of paid part-time staff and number of volunteers. Top five funding sources for the last two completed fiscal years, including names of funders and amounts. List any collaborative relationships—both formal and informal—with other organizations working to meet the same needs or providing similar services. Explain how you differ from these other organizations. The following section pertains specifically to the proposed program. Read the instructions for the narrative attachment and provide the requested information for the proposed program for which you are seeking funding. Type in 12 point font and single-space all proposals. Answer all of the questions in the order listed. Use the numbers and narrative headings listed below. Do not include any materials other than those specifically requested at this time. If you feel it advances your cause, you may refer to links in addition to your website. Note: See Section V below for the attachment upload process. How the program contributes to your organization’s overall mission. The specific unmet need(s) you are seeking to address. How the program will benefit an underserved population. Innovative strategies you will employ to implement the program and the basis for selecting these strategies. Anticipated length of the program. Any plans you have for collaborating with another organization(s). Expected outcomes of the program. Describe the transformative impact the program will have on the community, your organization, and/or the lives of the people you serve. If this is to be an ongoing program: your sustainability plans, specific sources for future funding once the Impact 100 grant monies have been expended, and your Board’s role in ensuring the continuation of the program. If this will not be an ongoing program, please explain. A detailed proposed budget for the program. Please present the budget in chart/spreadsheet – not narrative – format and in whole dollars. If the program budget equals $100,000, present one column of expense amounts including the following line items: salaries – list each staff person separately (noting whether existing or new hire) and indicate % of salary allocated to the program, staff taxes & benefits, staff training, consultant & contractor fees, rent & utilities, supplies & materials, equipment, printing & copying, technology, transportation, insurance and details of any other expected use of grant funds. The expenses presented must total $100,000. If the program budget exceeds $100,000, present two columns of revenue and expense amounts: one for the total program and one for the amounts allocated to Impact 100. The first revenue line item should be the Impact 100 grant of $100,000 in both columns. Other revenue supporting the program should be listed by source (indicate as to whether committed or pending) and entered in the total program column only. Expenses for the program should be detailed as set forth in the bullet above, entering for each expense the total for the program and the allocation to Impact 100 (which should total $100,000). If the total program expenses exceed the total revenue, describe how you plan to raise the additional funds necessary for the program. Your evaluation plan. Explain how you will measure the effectiveness of your program. Describe your criteria for a successful program and the results you expect to have achieved by the end of the funding period. The audited/reviewed financial statements should include a statement of financial position (balance sheet), related statements of activities (P&L), functional expenses and cash flows, notes to financial statements and accountant’s report thereon. The unaudited/unreviewed interim or full year financial statements must also include a balance sheet, P&L and cash flow statement. Submit in PDF format only. 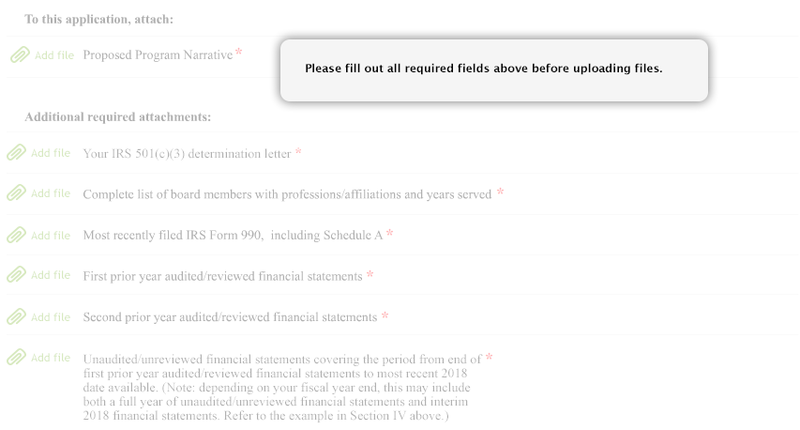 Note that in Section V Required Attachments below we are requesting, for tracking purposes, that the first prior year audited/reviewed, second prior year audited/reviewed, and unaudited financial statements be submitted as separate documents. Failure to provide the required financial statements including complete interim financials (i.e., balance sheet, P&L and cash flow statement) may be cause for disqualification. Contact Impact 100 Garden State with any questions. Completed applications must be submitted by 5PM on April 18, 2019. Note: Before submitting your application, you may want to print a copy for your records by using your browser print feature.